Celebrate with us the launch of Fluxedo, the new integrated data analysis platform. Not just social networks, but also news, IoT, apps, and any useful data for your business. Monitor your brand, your event, or more generally the topics of your interest on the main social networks, now 50% off. 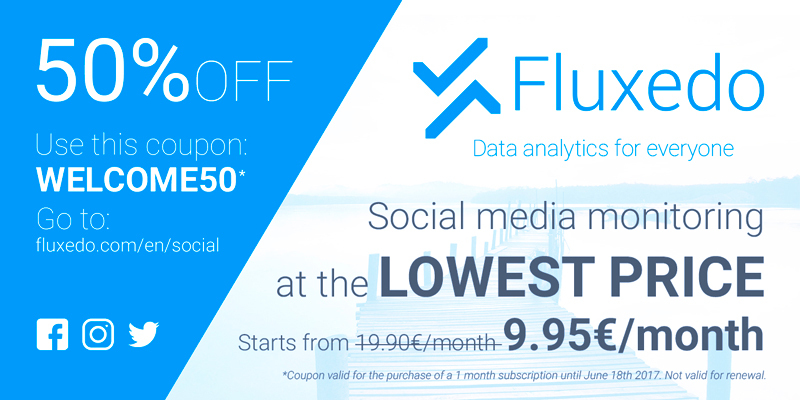 Use the coupon WELCOME50 and discover with the Social Flux the influencers, the most frequent hashtags and all the social-media statistics useful in decision making. Coupon valid for the purchase of a new 1 month subscriptions. Valid until June 18th 2017. Coupon invalid for renewal of active subscriptions.